February 2019: The roadworks taking place as part of the tramway upgrade will be completed and roads will be reopened. ''The new station will then be built following the demolition of the old Wilko store. I am deeply concerned by the so-called ‘regeneration plans’ of Blackpool Council. All they are focusing on is building a new hotel in the town and developing new attractions on central car park. I don’t think this will help the town at all. New attractions may bring more visitors, but if they all stay in the new hotels the old ones will just fall further into ruin. Less money will be spent with small businesses. Young people will be able to find plenty of casual work in the town for sure, but this is no good for anyone building a life here - you can’t support a family working in a fast food restaurant. Nobody will be able to compete with the giant attractions run by corporations, so small businesses which really provide an income for locals will begin to fail. 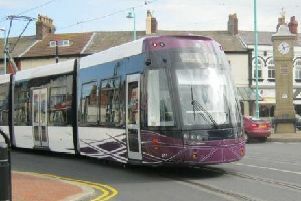 New tram links from the train station to the prom (pictured) mean visitors will be ushered straight to the seafront attractions, avoiding the town’s independent shops and hotels completely. I can’t be alone in thinking this way. Somebody needs to tell Blackpool Council this is a mistake. All of this work will only hurt Blackpool, not regenerate it. They are only thinking about the tourists coming in, not about the people that already live and run businesses here. Unless more is done to help small businesses then the town will just turn into one big amusement park. Really the council should be working for the people that live here, not the tourists alone. Do something Blackpool Council, before the real town of Blackpool, not the facade for tourists, fails completely!